The Posters will have a default text. You can, of course, customize it. 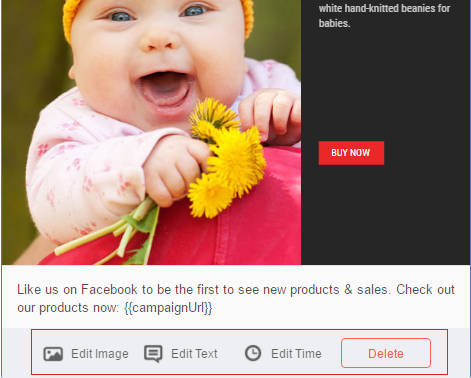 You can edit the text at two stages - a) while creating/scheduling the post, b) when the post is already scheduled. 1. In the right column of the ‘Create Social Post’ page, you’ll see the list of all the social channels. 2. Click on ‘Options’. Enter your text in the text box and click on 'Schedule Post' / 'Post Now'. 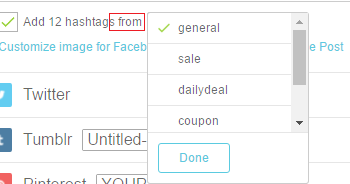 - We include hashtags in the text for all social channels. To remove hashtags from the text, please un-check the 'Add 14 hashtags from' box. - From displays the hashtag list. Click on the drop-down to select another list. 1. Click on the 'Calendar' tab in the left column of your dashboard. 4. Click the 'Edit Text' button from the bottom bar of the post and follow instructions. What is a hashtag list and how can I create it?